From my trip photo collection, sample the colors and textures of Scotland. Stirling Castle and environs is one of the most colorful places on Scottish soil. From the castle’s view of varied shades of green hills and darker trees, to rows of gray houses below and its flagged, green terraces above flower gardens, to the sumptuous tapestries, royal bedroom furniture, majestic banners, interactive kids’ exhibits, period re-enactors, to paintings and fabrics on wall, floor, and ceiling, this historic seat of power is well worth more than one visit. And don’t forget the Wallace National Monument on the next tree-covered hill to the northeast. Besides being uniquely spectacular in mountain majesty, Glencoe is Glen Colorful. Most striking to me in contrast to shorter deciduous-covered hills of the Ohio Valley and the sharper, starker, browner Rocky Mountains in the States are the blankets of green that cover the slopes of many of these ancient peaks in the Scottish Highlands. It’s my kind of green mountain. Some leafy trees sprinkle about them, creep up their sedimentary seams where the water rushes to the bottom. But some later-installed conifers in Argyll, the Cairngorms, and periodically up the Great Glen impose themselves like patches of black-on-black tartan made too small for its wearer. Forestry efforts compete with natural beauty. The most prized evergreens are the Caledonian forests of Scots pine, now mere remnants in the country. All over Scotland, with a high average rainfall, green is the go-to background color. Lichens, mosses, grasses and ferns are just a few of the non-arboreal results of this pervasive canvas. Princes Street Gardens in Edinburgh and the plethora of green spaces in Glasgow, which means “dear green place” from the (correction) “green hollow” in Gaelic, attest to green’s primacy in Scotland. 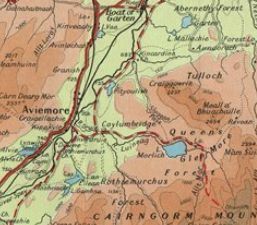 Red is another dominant hue in both wild and domestic Scotland. Red deer, red squirrels, Highland cows, some spray-painted sheep, and various burgundy, rust, and orange and yellow flora mingle with the greens. Ferns fade into bracken with the fall, and heather pops magenta-purple and then fizzles grey into autumn across the country’s vast moors and storied glens. Sandstone is the other big red. The Beauly Priory is a breathtaking example of ruins made largely of red sandstone. Lilac purples add magic to the greens and reds in both sun and shade, not just with the plentiful heather but with foxgloves, gems in cultivated gardens, and of course, the national flower, the thistle. But many flowers and plants retain their bright colors well into winter, re-blooming periodically, and the typical temperate-zone transition from green summer into red, yellow, orange, and brown fall happens in Scotland, too. Sheep are everywhere, like the grass they munch, and you probably know what that looks like. The flocks power the long-standing textile industry of wool and tweed in Scotland. Tartan long ago sported muted tones that blended with the natural landscape. After having been banned by the Crown following the Jacobites’ defeat at the 1746 Battle of Culloden, tartan’s revival in the late 1800s brought with it a flashier spectrum. Today, even women and girls can benefit from the plentiful choices in feminine shades among the clan-based plaids available at tourist shopping hot spots. The waters of life in the land of Scots range from root-beer rapids of brown and foam along the walking paths at Carie Forest near Loch Rannoch, Perthshire, to the golden gamut of whiskies forged in distilleries from the islands to the northern Highlands, to the deep-sea and turquoise blues of clear-sky-reflecting burns, rivers, firths, bays, and lochs. Modern Scotland has done its best with drinking water bottled from mountain sources, and then its worst in the hopelessly sugary, bubble-gum-flavored orange soda that is the national drink, Irn Bru. The British tea tradition also persists, alive and well in both city and countryside. A venture to Glasgow’s Willow Tea Room, designed by the celebrated Charles Rennie Mackintosh, gave my husband good Kenyan black tea and me some aromatic Jasmine green tea, neatly cut finger sandwiches, and a gluten-free chocolate brownie topped with clotted cream. I finished all of my teapot’s worth with pleasure, and I’m not even much of a tea drinker. I guess it was the blend of artistic atmosphere, my first real experience of tea time, and a well-chosen tea. Making it more memorable was an inchworm Jason discovered on his jacket from recent outdoor adventures. In and out of sight, we kept him alive till I dropped him accidentally on the stairway as we left. His ultimate fate is a mystery. It was also in Glasgow that we learned about the Glasgow Boys group of artists and the Scottish colourists featured in Kelvingrove Art Gallery and Museum. Influences from French Impressionists to “Whistler’s Mother,” and of course Scottish landscapes, informed their work over the years. There are life waters, watercolours, and water horses in Scotland. Modern architecture like the Kelpies, at the Helix car park and recreation center near Falkirk, celebrates the country’s artistic and industrial traditions, while one white and one black horse graze at the site of the Culloden Battlefield. Wild bird coloring is not all that different from home. The British robin redbreast is a distinctly different species from our American robin, a rounder, more petite orange-breasted songbird with a song that sounds prettier to my untrained ear than that of the omnipresent States-side version. I knew about that difference before landing in Scotland, but I was surprised to see the dapper-looking pheasant hanging around the farm bird feeders at the breakfast windows of our luxury B&B near Inverness. Not quite ring-necked, this male turns out to be the common pheasant of the UK, introduced to Roman Britain as a game bird from Asia. His aristocratic associations befitted our romantic, up-scale portion of the trip, evidenced by the rich red and white furnishings amidst the dark four posts of the bed and the crystalline bed-side dimmer lamps. They even gave us complimentary Ferrero Rocher truffles and a crystal of sherry and two champagne glasses. There’s a variety of local color in soccer jerseys on display at the National Museum of Scottish Football at Hampden Park, Glasgow, home of the Queen’s Park Rangers and the Scottish National Team. But some of the most colorful parts of Scotland are still its people. The dialects, sensibilities, hotel and B&B personnel, street performers, musicians including guitarists, accordianists, bagpipers, and fiddlers, cab drivers, store cashiers, theatre players, tourism workers from receptionists to historical figure actors, mostly courteous drivers we encountered, and everyday people were always, for better or worse, innocuous, pleasant, and helpful. Good for us tourists, certainly. Whites, blacks, and greys in the buildings, ruins, and stone monuments pulled us back in time to the mysteries of archaeological evolution. That is, the presence alone of chambered cairns and standing stone circles fascinates, but it’s even more interesting to learn of the layers of change their shapes represent, the multiple peoples and purposes that swept through a given place, obscuring the earlier inhabitants and users, muddling the picture of a Pict or a Scot or an Angle or a Roman. The clues keep bubbling to the surface in diverse ways, and their hunt can become an obsession, and a literary inspiration in the cases of authors such as Diana Gabaldon of the Outlander series. Whether you’re one for science or for literature, which Gabaldon and I both are, the romance of the past is real, palpable, just as the puzzles, if not the ghosts, left by the remnants beckon the solvers forward. Ruins, especially religious ones even to this agnostic, possess the most affecting beauty of all historic buildings, and the monoliths are at least figuratively magnetic. Ruins speak in a steady voice of struggle, violence, survival, and death. They show the creativity, innovation, reverence, passions, sorrows, and daily subsistence of peoples long gone, and sometimes they demonstrate long periods of thriving, the revival of resilient groups, and the diligence of those dedicated to preserving history and memory. At the Clava Cairns, I touched some of the piled stones as I walked into the center of one chambered cairn, but semi-unconsciously, I avoided touching the split standing stones. The stones at this site are said to have inspired Gabaldon’s invention of Craigh na Dun, the central plot mechanism–strange and terrifying–of the entire Outlander saga. The ubiquitous nature of stone and stonework in Scotland adds an indescribable charm to visiting this old country when one’s own is so young by contrast, but the stories they inspired are what sent me there. There’s no generalizing Scotland, and yet the tourist tends heavily toward equating places with their people. In the end, they are inextricable, multi-dimensional, many-layered and intriguing enough to merit repeat exploration. Besides, I just love to hear Scots speak, even if I don’t understand them the first time, or, in the case of Glaswegians, the second or third. Although I’ve seen a lot, I hope I’ll get another chance to practice listening in Scotland.